Art in General presents Traitor Muscle, a New Commission and the first major solo exhibition in New York by Joseph Buckley. The artist’s practice centers on the relationship between grief and postcolonialism. Against a backdrop of contemporary fascism, Buckley employs a range of visual and cultural references—from sci-fi to modernism to Doc Martens to slave ships to Amazon’s factory floor—asking us to deeply consider society’s divisions and fractures, using the medium of sculpture to investigate the psychic technologies that enable them. This body of work continues Buckley’s investigation into historical, fictional, contemporary and speculative abuses that render people into “chattel, orcs, suspects, and clones.” His ongoing research into the sources and symbols of feudalism, racism and imperialism infuse the work. Central to Buckley’s practice is the use of “non-materials”—ideas, processes, people—manipulated in manners that mimic the archetypal languages and processes of sculpture. This lends itself to an ongoing critique and consideration of the mechanics of objectification, and the obverse of objectification: dehumanization. 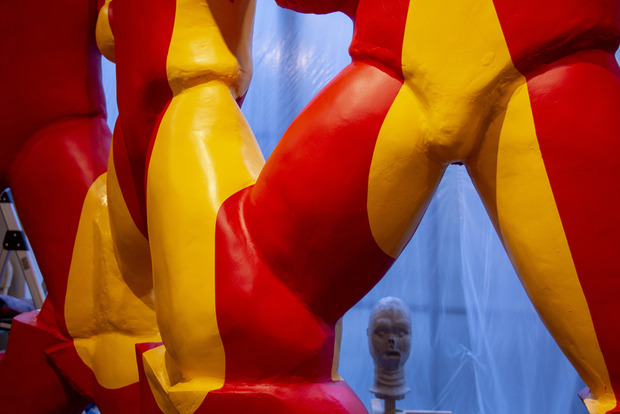 Traitor Muscle centers around a trio of new sculptures. Standing at 9-feet tall and 12-feet wide, Best Clone Sons are fitted with riot gloves and yellow teardrops that function as a symbol of performative grievance. Glass Aristocrat is an optically clear figure who wears a fine suit and sits upon a custom-made replica of a Roman Senatorial throne depicted throughout Neoclassical painting. Orcish Shelving System consists of 64 life-sized orcs stacked atop one another, a fictional humanoid race originating in the writings of J. R. R. Tolkien which has become a widespread archetype used across the genres of sci-fi and fantasy. In addition to these works, each surface of the exhibition space features installation elements, including a floor with bright red and green delineations to suggest the logic and layout of an automated factory floor and a poem by the artist inscribed onto the window, confronting the hegemony of the artworld’s whiteness. Here figurative sculpture’s art historical lineage is contrasted with up-to-the-minute materials, concerns and aesthetics. Visual references to medieval battle armor blend with forms from Star Wars and Warhammer. A genealogy of Doc Martens boot wearers from factory workers to skinheads to hipsters is recalled. Traitor Musclepoints to obscured violences and mechanisms of exclusion everywhere embedded and naturalized in the world around us. The powerful and often unexpected combinations of references, symbols, histories and meanings employed by the artist give the work its striking resonance and allow it to speak clearly in speculative vernacular to real-world conditions.